The 64 began its design life in January of 1981 when MOS Technology engineers decided they needed a new chip project. MOS’ Albert Charpentier had been responsible for several of the highly successful VIC-20 chips. “We were fresh out of ideas for whatever chips the rest of the world might want us to do. So we decided to produce a state-of-the-art video and sound chips for the worlds next great video game”. By November of 1981, the chips were completed but Commodore’s president Jack Tramiel decided against using them in the faltering arcade game market. 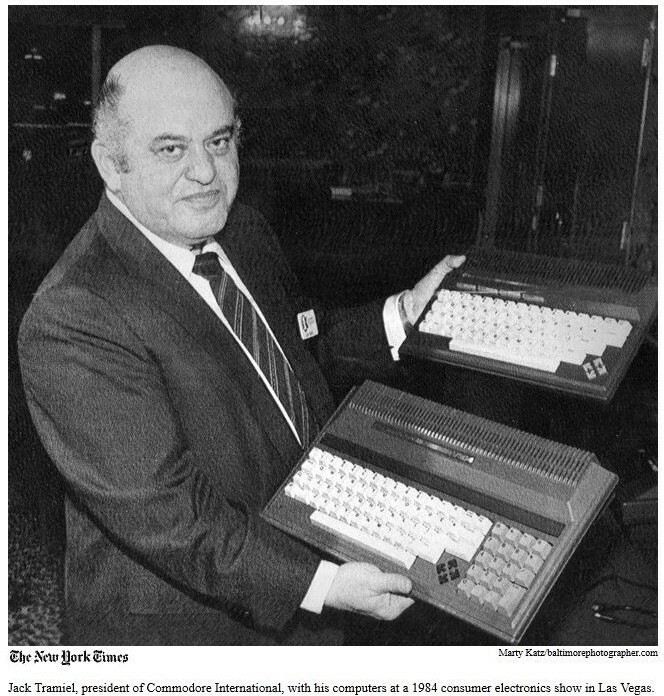 Instead he tasked the engineers with developing a 64 kilobyte home computer for show at the Winter Consumer Electronics Show (CES) the second week of January 1982; just 6 weeks away. Two days after Jacks request, the basic design was completed and by the end of December 1981 the hardware for five VIC-30 (the C64’s development name) prototypes were assembled. In the remaining two weeks, the VIC-20 operating system with lowly Commodore Basic 2.0 was stretched onto the C64. With an estimated retail price of just $595 ($1250 dollars in 2018), it was the buzz of the show. 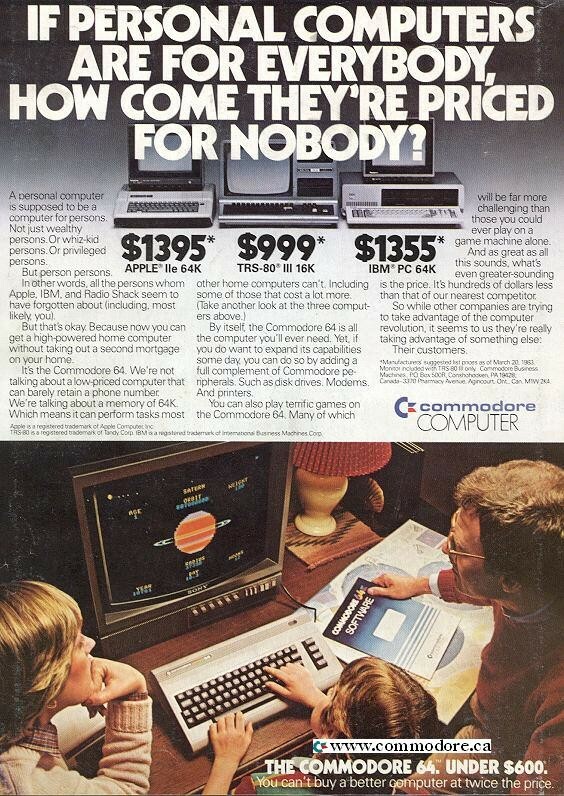 It did not hurt that there were no other new powerful computers shown at CES by Commodores competitors that year. The Commodore 64 was alive: it was immediately ordered into production which hit full stride by August 1982. The Commodore 64 is arguably the easiest to use programmable computer that has ever been made. Like the PET and VIC-20 before it, the 64 booted to a friendly screen with the Commodore Basic Operating System ready and waiting for instruction. If writing your own programs was too daunting and loading software from cassettes or floppies was ‘just too much’ for you, you could just jam a cartridge in the back of the unit and like magic your machine was doing whatever you wanted it to. Creating the best selling machine in history is no small feat. Commodore did not ‘knock the ball out of the park’, they ‘knocked the park into the next city’. The pushed the industry to a level of scale that was previously thought impossible. Like its VIC-20 predecessor, the 64 was the first computer that millions of today’s programmers, designers, engineers and enthusiasts had ever used. It has inspired a countless volume of software and hardware that we use today. According to Charles Winterable, Commodore’s Worldwide Engineering Director, “We defined in advance the die size that would give a yield we were willing to live with. …Then we prioritized a wish list of what needs to be in there to what ought to be in there to what we would like to be in there. …When he ran out of registers, he stopped.” With two draftsman and a CAD technician they developed “first silicon” in just 9 months and shockingly it worked on the first try. The VIC-II 6567 video chip in the 64 can produce about 128 colours but was only engineered for, and only officially supported, 16 colours. “The width of each pixel is almost half of the NTSC colour clock, so when you alternate the pixels of two different colours, instead of getting the two colours that you think you’re getting you get a whole new phase interpretation” Brian Dougherty, President of Berkley Software explained. It displayed a large 320 x 200 character count. 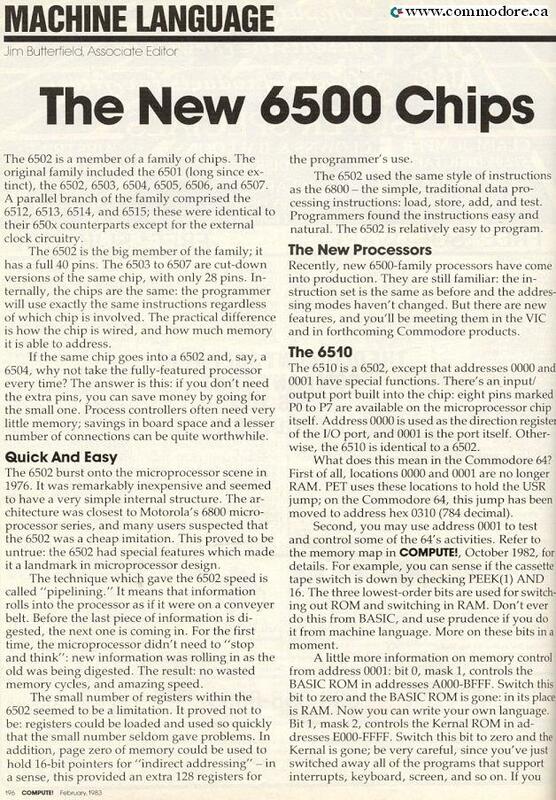 The now legendary SID 6581 sound chip was astounding for its time. It could play three different “voices” in sophisticated patterns and with some tinkering could be made to create one or two more. It was without doubt the best sounding computer on the market at any price for years to come. It was also likely the first computer in the world capable of reproducing a recognizable human voice without the addition of peripheral hardware. The most common C64 chip question is why does the screen say 38,911 bytes free when it supposedly has 64,000 bytes of memory. This is because nearly half of its memory is used for internal functions like Commodore Basic 2.0 (a.k.a. Microsoft Basic). .
C64 1982 & 1992 MotherboardsYou can see that there are about 40 chips on the 1982 board (note that there are several chips hiding under the daughter board near the bottom right and in the silver video housing). In comparison the 1992 board has only about 1/3rd as many. That will save a few dollars! Jack Tramiel believed that budgets were a “licence to steal”. He wanted staff to argue for every dollar they spent rather than giving them a fixed amount of money and telling the to get the job done. As a result no one knows what it cost to produce the initial year or so of engineering work. Commodore used an informal accounting system that made extensive use of otherwise idle physical and human resources at the MOS production facility in Norristown Pennsylvania. If Commodore had not owned MOS, the design costs may have been prohibitive and the C64 may have never been even conceived. The 64’s initial production cost target was $130 ($300 dollars in 2018); it actually came in at $135. 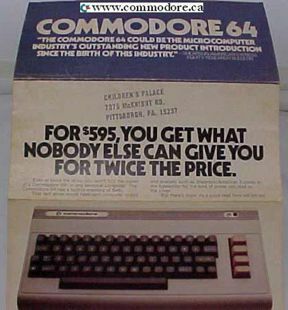 The opening price of $595 ($1350 in 2018 dollars) would leave a handsome profit for Commodore, even after packaging, promotion and distribution. Within a few years it was estimated that component cost decreases combined with production efficiencies had dropped the cost of manufacture to less than $50 ($110 dollars in 2018). 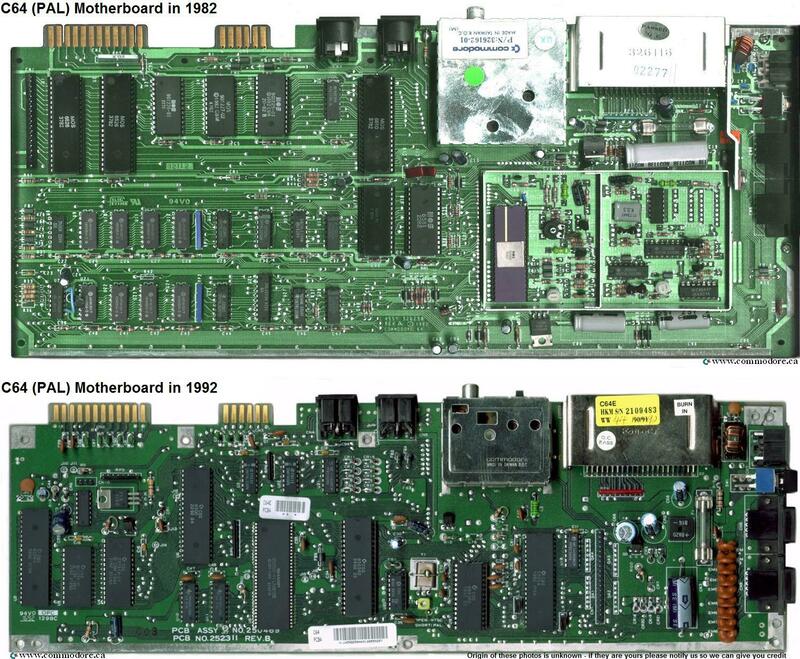 You can see in the photo on the left that the original 1982 board had about 40 chips on it while the the final 1992 board had only about 15. The C64 uses Commodore Basic version 2.0 even though a substantially improved Commodore PET Basic 4.0 was available. This is because the upgrade would have required more Read Only Memory (ROM) which would have cost more. 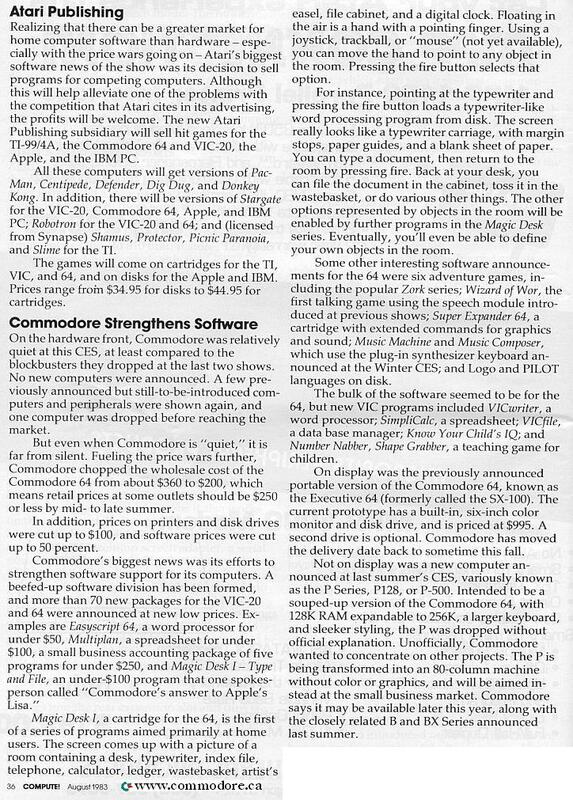 While researching the Commodore VIC-20 we found claims the Commodore CEO Jack Tramiel also liked the idea that shipping Basic 2.0 would leave a nice upgrade path for consumers to buy an add on cartridge to provide more commands and we have to think that logic was still at play with the C64. Because the VIC was such a huge success it was “obvious” that they should reuse that machines plastic chassis. Reducing the size of the cartridge slot, changing the colour and slapping on a new logo was all that was required. Before its announcement at CES, retail prices as high as $1000 ($2275 in 2018 dollars) per unit had been proposed for the base machine (i.e. no floppy drive, cassette drive, or monitor). Quickly the price was set at a more reasonable $595 ($1350 in 2018 dollars). 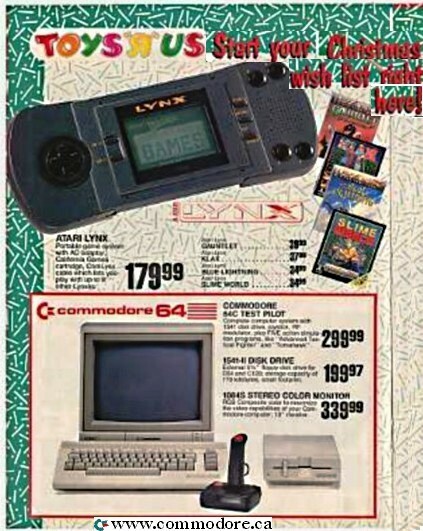 C64 TOYS R US 1990 – It was definitely cheap! 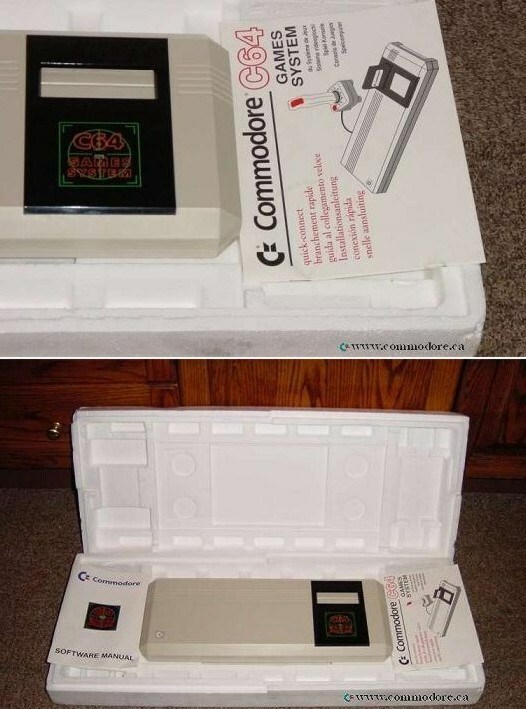 Based on the VIC 20 distribution model, Commodore packaged the 64 in small and most importantly, cheap paper ‘boxes’ which were stacked inside of cardboard stand-up’s. Sears, Toys ‘R’ Us, Montgomery Ward, Fred Meyer, K-Mart, Lionel Play World, sold these machines along side their usual produces like toasters, clothes and hammers. Of course the 64 was also available at through Commodores professional computer retailers and specialty computer shops like Austin Hook’s The Computer Shop in Calgary Alberta Canada which is the oldest computer store in the world. By the mid 80’s large dealers were buying the 64 for about $100. Some retailers sold 64’s for less than $100 hoping that consumers would buy the floppy drives, printers, disks, modems and desks, which they made much higher margins on. In 2003 I sold a 1541 floppy disk that was originally purchased from Canadian Tire and still had the shocking retail price sticker on it of $399! There was definitely margin in the extras. Because production of 64 circuit boards was designed for the “auto-insertion” VIC-20 factory in the US, there were problems from day one with the Japanese plant which used manual-insertion production lines. Local standards also wrecked havoc; the Japanese used mainly metric screws while the US lines worked with ‘English’ screws so when components were shipping between facilities, the result was not always pretty. “It takes a very tough person to say ‘I’m not shipping these because they’re not as good as they could be – especially when people are clamoring to buy them” explained Charpentier. There was a so called ‘sparkle’ problem which caused small ‘lights’ to appear on the screen of the first few hundred thousand units. Most thought the problem was caused by defects in the video chip but in fact the problem was voltage spikes caused by a series of 64 systems that adversely affected the ROM chip. This same MOS ROM had been used in 3 million other computers including the wildly popular arcade game “Asteroids”, without problem. Depending on the colours, the edges of some objects would appear slightly out of line because Charpentier miscalculated the number of clock cycles on each horizontal video line. “Instead of 65 clock cycles per line, I had 64”. This problem took five months to correct. “They don’t test. I’ve opened up brand-new Commodores and found traces cut. They obviously use a power screwdriver to assemble the C-64, sometimes miss the screw and chop the traces.” criticized one of Epyx Software staffers. To top this off Commodore had moved its engineers to Head Office in Pennsylvania, away from the California production line which caused communication to be further strained. If you are having problems diagnosing your C64’s problems, click HERE for a great troubleshooting guide. The Commodore 64 has sold more than any other computer in history. The Guinness book of Records estimates that there were about 30 MILLION units pushed out of Commodore plants even though most historians argue that the real number is closer to 20 million units. Either way, it is a record breaking achievement. In addition to the 64 being a fabulously powerful machine produced at time of exploding computer popularity, it was also without doubt the longest production run in history. 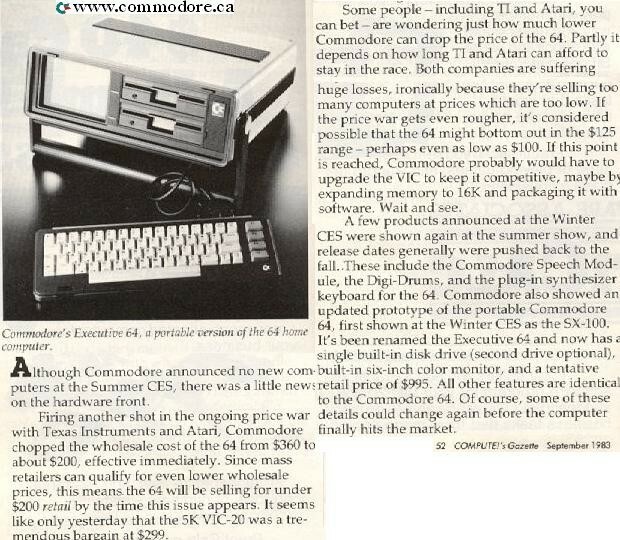 From early 1982 through to 1992, Commodore manufactured several minor derivatives of the machine to keep its profits paying for Commodores many many mistakes with newer products. The 64C came in a sleek beige plastic case. 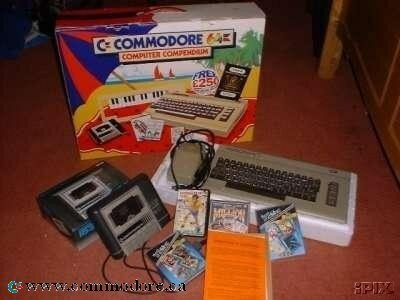 Commodore kept the 64 in the ugly brown ‘VIC-a-like’ box because it was cheap. Other than some minor circuitry revisions (and the case obviously), the 64C was identical to the original 64. The 64C came with Berkley Software’s famous GEOS Operating System and modem linking software. This made the 64 a minor competitor to IBM PC’s with original versions of Microsoft Windows 1, 2 and 3. GEOS was MUCH more mature and capable than Microsoft’s fledgling Windows, but a combination of excellent copy protection (which hindered its spread / popularity) and it’s minimal base hardware (the 64) made GEOS’ life all too short. While new versions of GEOS are still developed and produced for commercial sale today, its commercial significance died with the 64. 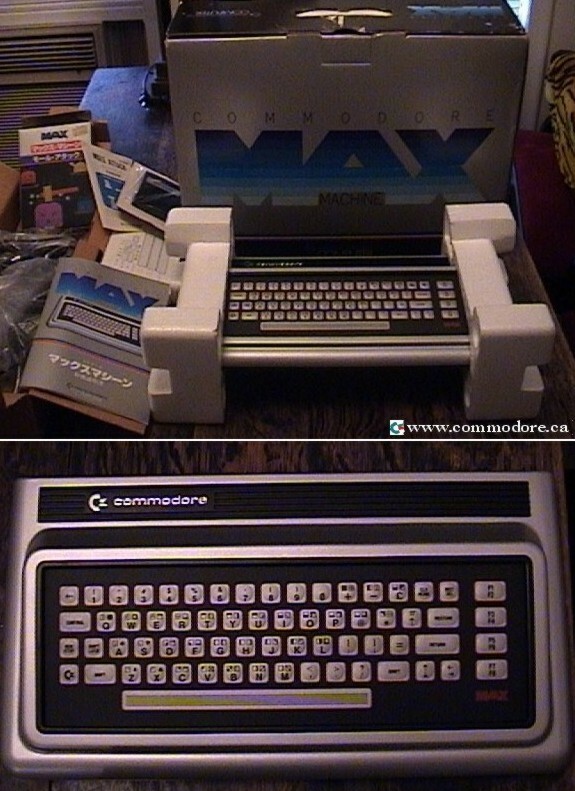 The most interesting C64 Derivative was the Commodore Max Machine. It was announced in Germany and Canada but was only released only in Japan. The MAX was anything but. It was a much cheaper version of the Commodore 64 with only 8K of RAM and a very bad membrane keyboard. This combination makes it one of the rarest and most sought after production Commodore computers. This limited system has two joystick ports, a cartridge and cassette port, RF out, audio out, channel select and power input. The 64GS was a keyboardless version of the 64 released to Europe in 1998. The idea was to further reduce cost to produce a low price gaming console. 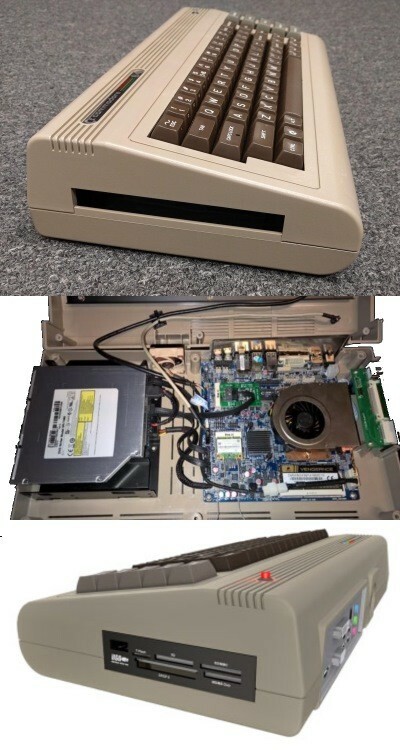 The 64GS was a little white box containing a C64 motherboard with a cartridge slot on top. 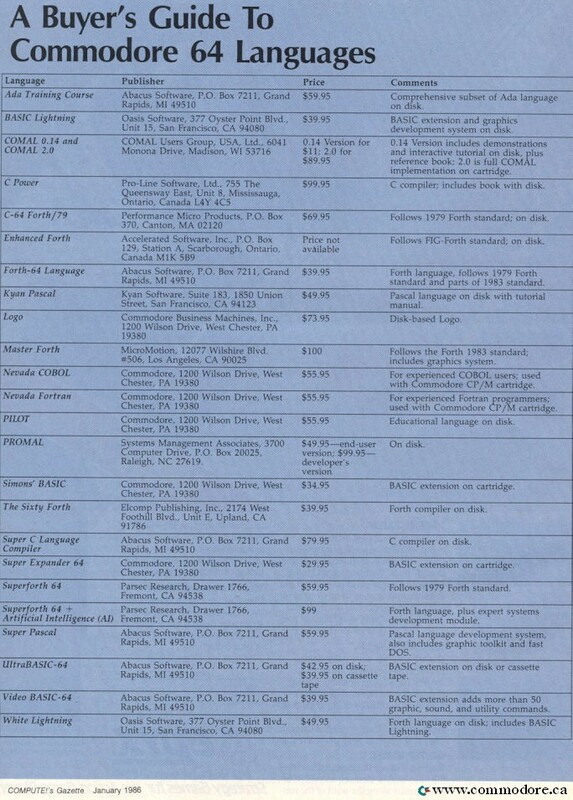 If the production cost of a regular C64 was $50, the GS was likely near $40 ($90 in 2018 dollars). It did not sell well. In fact I have never seen one, other than in pictures. There were seemingly countless Commodore 64 bundles to keep sales moving including Terminator II bundle, a 64C TV Quiz Pack and so many more. There were even several $995 ($2100 in 2018 dollars) laptops (ok, laptop is a stretch; they were 25 pound luggables) executive versions of the 64 called the SX-64, DX-64, and the SX-100. These began to appear in 1983 which was fairly early on in the 64 life cycle and taken by some to as an indication that the C64 laptop was planned as an expansion product rather than a way to resuscitate a dying line. 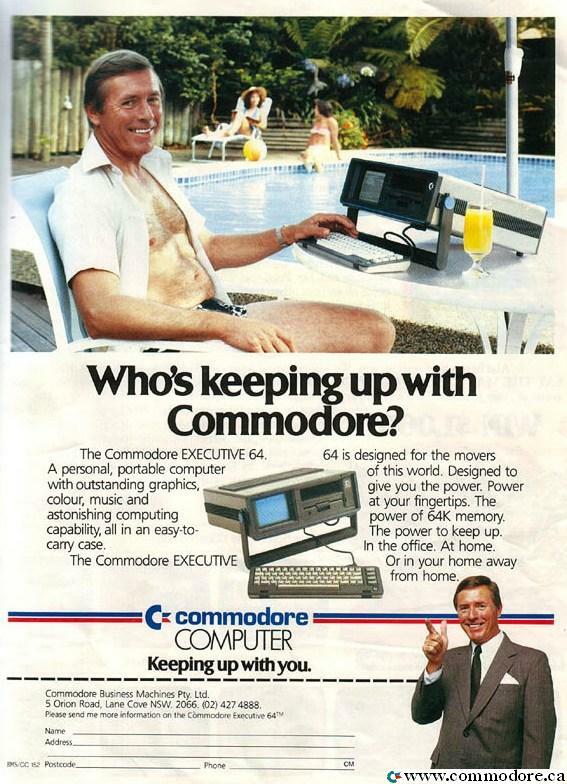 COMMODORE SX64 LAPTOP – PORTABLE: Who’s keeping up with the Commodore Executive? 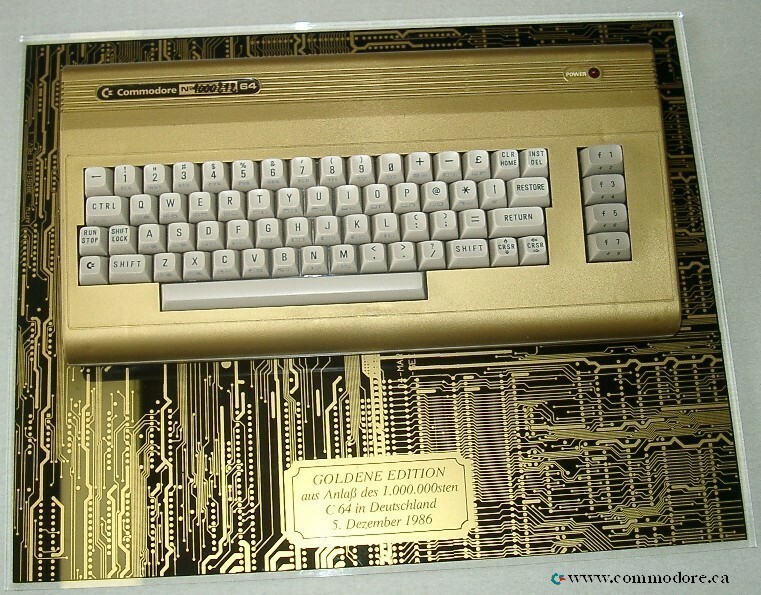 Golden Commodore 64 Very limited “production” to celebrate 1 million units being productions. These units are supposed to be fully functional, but in fact Commodore staff simply took problem 64’s that had been returned / warrentied and turned them into these highly collectable units. Commodore produced fully functional Golden 64’s in various markets. These “Jubilee” machines commemorated the 1,000,000th unit produced. In the US, Golden 64’s were shown at the 1984 winter CES. More than 350 Golden 64’s were produced for Germany’s one millionth celebration in December of 1986. Although the machine had important flaws, the Commodore 64 design team created a fantastic machine at very low cost which soundly thrashed the competition for years. How did they do it and why would it prove to be nearly impossible for Commodore (and most other companies) to replicate process in the future? The design success is widely attributed to the fact that engineers were not intending to build a computer, just some chips, so the corporate bureaucrats left them alone. Engineers did the core market research and developed their own standards. In the end, nearly the whole C64 team, Al Charpentier, Robert Yannes, Charles Winterable, David Ziembeicki and Bruce Crockette, left Commodore early in 1983 and started Peripheral Visions which was quickly renamed Ensoniq. Ensoniq was purchased by Creative Labs (the sound card company) in the late 1990’s. Before Commodore went bankrupt in 1993/4, it was rumored that engineers were secretly working on a new improved (but still 8 bit) 64 called the C65. After the bankruptcy dozens of prototypes, schematics, drawings, engineering notes, and system components were sold to the highest bidder. Because Commodore Canada was the last division to fall, much of this inventory had been moved from other sites to their Toronto headquarters and this is where most of the of the prototypes came out of. The mighty 64 has sprung up from the ashes of Commodores dissolution, in the form of the C-One. The Commodore One was conceived in 1999 by engineering student Jeri Ellsworth. Her original intent was to create a circuit that would allow the original Commodore 64 to function with a modern VGA monitor. 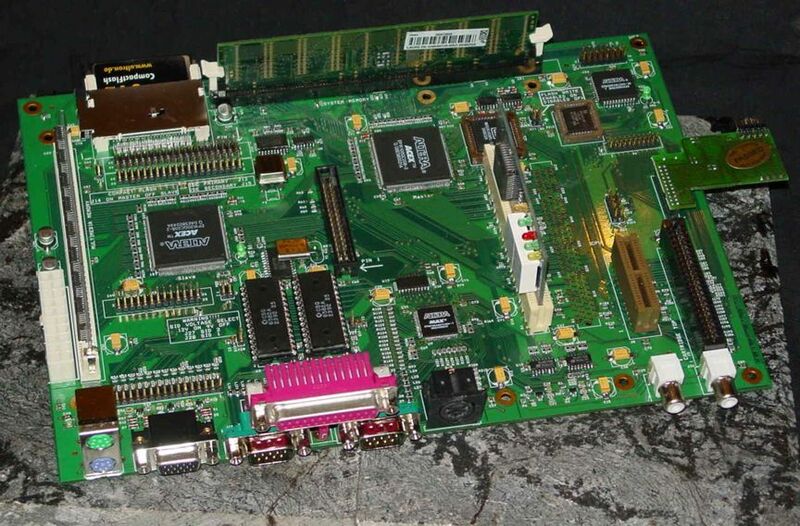 After learning the complications of such a task, the work expanded and expanded and now is a full blown 100% C64 compatible machine for about US$200, that uses a DIMM, Flash Memory, SVGA Monitor and other modern hardware. The C-1 has now been branded “The Reconfigurable Computer”. The intent was to produce a machine that is as updatable as possible. Not just thing like the BIOS but core system components: “…it evolved into a re-configurable computer, a new class of computers where the chips do not have dedicated tasks any more. The two main chips carry out different tasks, depending on the needs of the program. The technology used is called FPGA – field programmable gate arrays. These chips can be programmed to do the tasks that the chips of the C-64 or other computers have done. It’s no emulation, but it’s a re-implementation of the chips that are no longer available since many years. The one thing that is not contained in the FPGAs is the main processor – it would take too much space, resulting in too high cost. To maintain flexibility, the CPU resides on a card that can be exchanged by the user – as simple as plugging in a PCI card. For the most current news and information on the Commodore One click HERE for the official page. As in it’s “hay day”, it seems the 64 is had to beat and harder yet to kill. The final chapter of the history making Commodore 64 is not still yet written nearly 40 years after it began as just an idea for some chips. Commodore USA was setup by Barrie Altman who has an interesting background with media broadcasting and now runs a furniture company that manufactures knock-off high end furnishings. This new entity has a license to use the Commodore brand from the Commodore BV (the Commodore brand copy write and trademark owner in 2013) . Following the pattern established with the furniture business Commodore USA originally sold re-stickered very low end PC’s manufactured in China. We interviewed Barry in 2010 and he made no oligopolies for it. 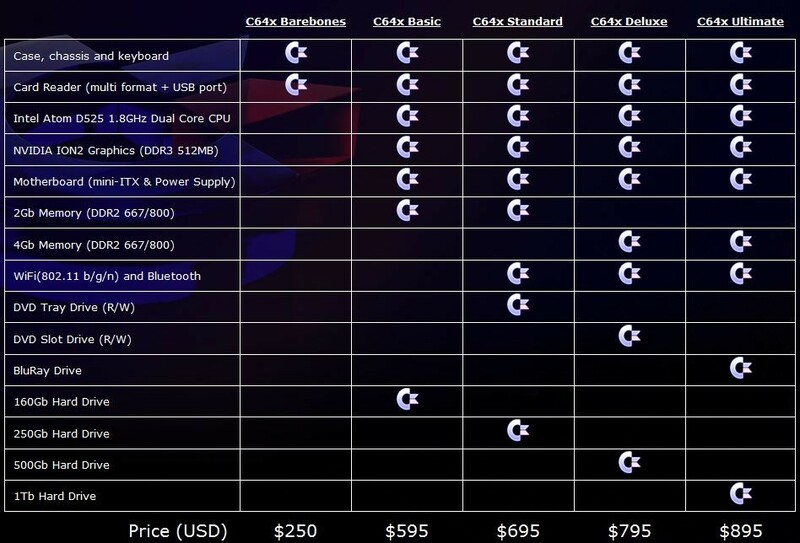 In 2012 Commodore USA produced a custom chassied modern PC that looked like the classic Commodore 64. As an Intel Core i3 to i7 based PC it would run any modern Operating System including Windows 8 or even Windows Server 2012! In December of 2012 Barrie died and it did not take long for Commodore USA to follow. Final Note: If you want to play the games or run other applications but do not want to bother with the hardware, there are many of excellent emulators that allow you to run 64 programs on your PC. 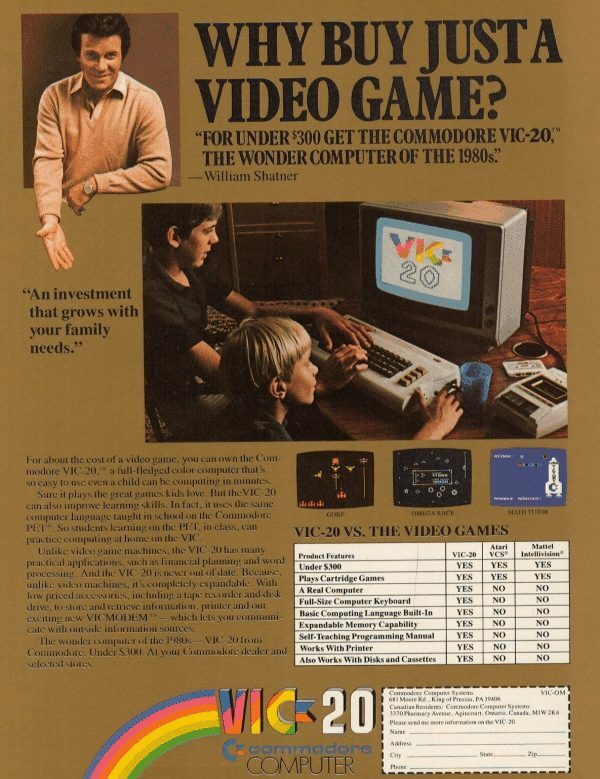 We suggest using VICE because it emulates almost all Commodore hardware and you can download it from this site on our Download menu item at the top of the page. C 64 Software usually referred to now as ROM’s are available for VICE on hundreds of websites. Nearly the whole C64 team, Al Charpentier, Robert Yannes, Charles Winterable, David Ziembeicki and Bruce Crockette, left Commodore early in 1983 and started Peripheral Visions which was quickly renamed Ensoniq (which becomes part of Creative Labs in the late 1990’s). After many false starts and name changes, Commodore Business Machines ships the Executive 64 with one 1541 type 170 KB floppy and 5″ colour screen for $995. This is the worlds first portable colour computer. Golden Commodore 64Very limited “production” to celebrate 1 million units being productions. These units are supposed to be fully functional, but in fact Commodore staff simply took problem 64’s that had been returned / warrentied and turned them into these highly collectable units. Very Rare C64GThese 1998 German and UK units used the same motherboard as the 1995 Commodore 64C but as you can see the were housed in a white version of the old bread box case. Note that the Commodore logo is different and the power LED is green. Z80 Video Pack 80Turn your C64 into an 40 or 80 column black and white display. It had a Z-80 processor built into it so you could use CP/M! A company called “Data 20” produced these in the early days of the C64. This is an extremely rare find that would have been emensely helpful. As such we assume it did not work very well, was incompatible with most software or was very expensive. If you have any information on this device please contact us. Commodore 64 Car Pilot GPS: CarPilot ‘Computerized Automotive Relative Performance Indicator and Location of Transit’. This has to be one of the first GPS mapping systems to be tested. Note that the first GPS satellite NAVSTAR 1 went into space in the 1970’s but was not make available for non-military use until 1983 so this system likely did not use GPS. I don’t know who sent this to me, but thanks! Experience the fastest computing experience to carry out essential operations on your remotely accessible next generation virtual PCs from www.CloudDesktopOnline.com. Try out hosted SharePoint, Exchange and Office 365 products from Apps4Rent for enhanced team collaboration.